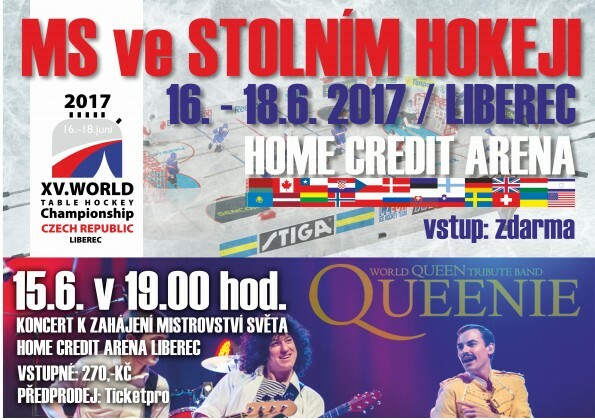 Dear friends, on June 15 (Thursday at 19:00) we will perform at the Home Credit Arena in Liberec participating in the opening of the World Table Hockey Championship, which will take place from the 16th to the 18th of June 2017 and will feature the world's top players of this sporting game from 24 countries. During the concert intermission a demonstration of table hockey with the participation of the best international and Czech Stiga hockey players will take place. Throughout the championship you as spectators will have the opportunity to get in close proximity to the playing tables, which is rarely possible in other sports at this level. We look forward to seeing you.